For reasons that will become clear, this is less a review than a kind of personal column. For Opera Nuovo’s recital of song cycles at Robertson-Wesley United Church on Saturday June 9th was so interesting, and so uniformly entertaining, that it deserved more than just a mention. Opera Nuova, of course, is the Edmonton-based company that, every summer from May through June, operates a training program, admired across Canada, for young singers just starting on – or about to start on – an operatic career (59 of them this year). As part of that program, Opera Nuova puts on a series of events in a Summer Musical Theatre Festival, where the participants in the program have the opportunity to perform. This year there have been a series of song recitals deliberately reflecting the diversity of Canadian immigration for Canada’s 150th anniversary, and two main-stage productions (Gilbert & Sullivan’s Patience, and Tchaikovsky’s Eugene Onegin), with two more still to come: Janáček’s The Cunning Little Vixen, and Rogers and Hammerstein’s Carousel (June 23-30, at Festival Place, Sherwood Park). 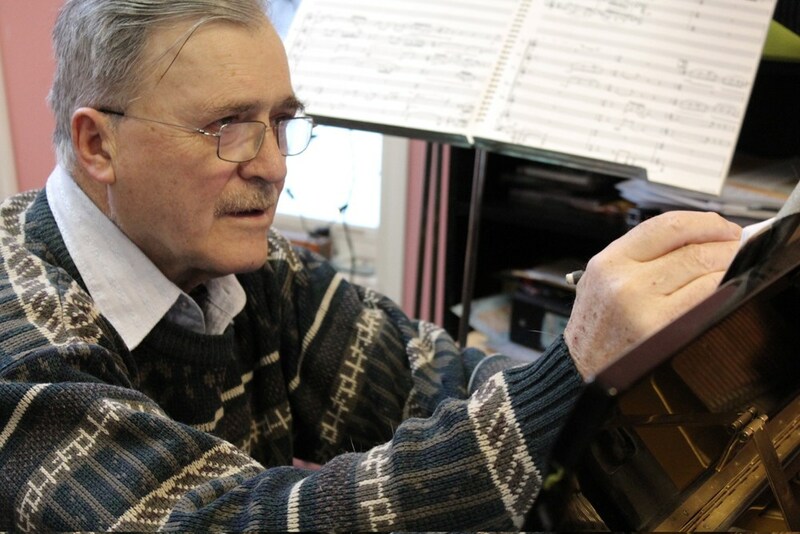 Saturday’s concert was titled ‘Letters Home’, and was built around a new song-cycle of the same name by Manitoban composer Ken Nichols, who celebrated his 80th birthday last year – the song cycle was commissioned to celebrate that anniversary, and was premiered in Brandon last July. That’s where the personal column comes in, for I wrote the words for this song cycle – some 30 years ago. I had met Ken when we were both taking part in the Banff Centre’s Music Theatre program (we wrote a one-act opera together there), and he had taken me down to the area around Picher Creek in Southern Alberta where he grew up. It is, for those of you who don’t know it, one of the most beautiful places in Canada – the rolling undulations of the Rocky Mountain foothills, with the massive mountains slicing up perpendicular so close on the west, the flat endlessness of the prairies to the east, Waterton National Park and Montana to the South, and the Oldman River winding through it. It’s so beautiful that Edward, Prince of Wales (later Edward VIII) bought a ranch there in 1919 (and regularly visited it before selling it in 1962). It was, and still is, ranching country – cattle ranching, and Nichols’ relatives told me stories of how, when sent to move some cattle from one place to another, he was so often forgetful, as he was usually daydreaming up some music. He himself told me ranching stories, of, for example, riding alone over a ridge, and looking down and seeing grizzlies and their cubs romping among the stubby little trees, or sitting as a boy listening when an Elder from the nearby indigenous reservation called by. I loved the country, and, new to Canada, I was fascinated in particular by the history of the early immigrants – of whom the Southern Alberta ranchers were among the very first. While at Banff, I read as much as I could find, from historians to original accounts. I drew on this – or rather, I was inspired by this – for the set of prose poems for Ken Nichols that are the text of his song cycle. I handed them over, and then promptly forgot about them, and he said them aside, as it turned out, for three decades. It’s a very strange thing, hearing settings of your words from 30 years ago. I can’t remember virtually any of the actual words of the many operas and texts for composers I have written over the years – it’s a blank area for me, though I can always remember the general feel of a piece, the ethos, and often the structure. And I couldn’t remember a single word from this one. So in writing about it here, I am writing as if a stranger to my own past. The basic premise is simple: a series of letters written to home by very differing immigrants starting out life in southern Alberta at the end of the 19th and beginning of the 20th century. There’s a wife of a pioneer who has taken possession of, and is breaking, his section – she has joined him, and is appalled at the pioneer living conditions and the mud and turf hut that is their first home. There’s an Italian immigrant, writing to his mother to tell her to stop asking him to return, as for him this new land is the land of opportunity. There’s the rancher’s wife, rich enough to order her dresses from fashionable city couturiers. There’s an RCMP officer, who came out west with the force, and is now about to retire from it. And, in a duet, there is a homesteader couple, singing with thanksgiving of their new life. These have been hauntingly set by Nichols, for soprano and tenor with a string quartet and piano (in the Brandon premiere Nichols added a double bass), and in a generally tonal idiom. The solo lines are based on patterns of speech, dramatic, almost operatic when needed. The sophisticated and evocative writing for the instrumental forces is in darker minor keys, with shades of modal scales. I was reminded of the similar combination of human and natural environment, and similar forces, in Vaughan Williams’ On Wenlock Edge and Warlock’s The Curlew. Letters Home comes out of the same general tradition, a kind of Prairie equivalent, with at times something of the austerity of both those earlier cycles. Particularly arresting – and beautiful – is the duet between the two homesteaders that ends the cycle. The performance was semi-staged rather effectively by Opera Nuova’s Directing Intern, Martin Galba, with suitable items regularly emerging from a central travelling trunk, a reminder of immigration itself, the journeys across the sea, and the fleeting nature of human existence. It was also well sung by tenor Ross Mortimer and especially soprano Brittany Rae, whose natural acting utilized both voice and stage presence. To rediscover my words after 30 years (I was abroad, alas, for the Brandon premiere) in such wonderful settings was more than I could possibly have expected. Thank you, Ken, and thank you Opera Nuova. In this I am, of course, biased, but for the rest of the concert I can put on my critic’s hat. It opened with Three Songs from the West Coast, arranged by the father of Canadian composition, Sir Ernest MacMillan. In 1927 he travelled to the West Coast with the folklorist Marius Barbeau, and transcribed over 70 traditional songs of the Tsimshian People. He arranged three of the songs for high voice and piano, which some will know from the Jon Vickers recording – the vocal lines are entirely Tsimshian, as MacMillan didn’t change a note of his transcriptions, merely adding the piano accompaniment. The three songs – the first the celebration of a new chief’s first dance, the second a lullaby, the third in which the singer chastises idle gossipers – are, for me, some of the most memorable Canadian music ever written. But these days, of course, there is a contentious aspect to them, as the question of appropriation raises its head. Opera Nuova came up with the perfect solution, which was to sing the songs in their original language, and not in the English translation that Vickers largely uses. This respected both the origins of the songs (and the songs themselves), and they were very effectively sung by Chris Donlevy, whose strong, slightly dark toned tenor suited them admirably – and somehow he managed to create the aural effect that he was singing in the outdoors, which again entirely worked. Quite – and the same might be said of Opera Nuova’s revival of them, a celebration of an indigenous Canadian music joining hands with the classical tradition – the kind of bridge the world could sure use now. The final work in the concert was equally intriguing, and was by a composer I had not come across before. American Ben Moore was born in 1960, and is primarily a composer of vocal music (there are two operas). His Dear Theo is a brilliant conception: a setting of a judicious choice of Van Gogh’s revealing letters to his brother Theo (it also exists in a version for chorus). Fascinating, too, was the portrait of the painter that emerges, from his fears, to his pride in what he is painting, from his thoughts on children, to the poignant ending (“I must leave a souvenir”). In works of this kind the music really comes second to the words, but here the settings achieve exactly what they set out to do, giving the singer a wide range of sometimes dramatic emotion, and it was very convincingly sung by tenor Michael Eusebio – not the least in his excellent diction, allowing us to hear those remarkable writings. The entire concert was clearly greatly appreciated by the audience – and rightly so, for this was just what a festival should be doing: introducing three works, all fascinating in their own ways, that the audience would probably never otherwise hear, and doing so in style.